Restoration of all the atrohic jaws possible. Perfect for restoration of cranio maxillofacial cases. Doesn’t depend on alveolar / cancellous bone availibility . 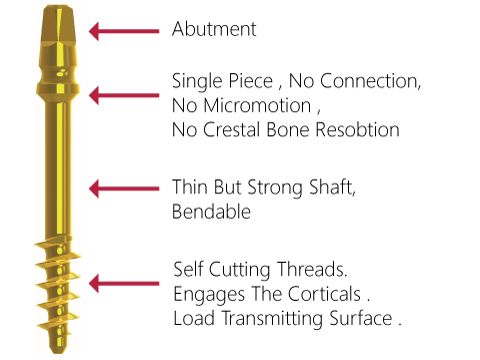 Engages the nonresorbable corticals and buttress which are meant for load bearing . It is smooth surface and has noitis® surface resist peri implantitis. Being single piece no crestal bone resorbtion. It’s the best for pterygoid approach , avoiding cantilever. Double or tripple pterygoids are made possible of its simplified yet intelligent design.